TGS Season 2: Stephen R. Sobotka, Jr.
Carolynn "Aerie" Marie: Gargoyles/Pendragon 2 - Meet the Minions; Double Take; Triangles * Timedancer 2 - To the Soul; Survival *** Pendragon 3 - The Relectant Thief. | Timedancer 3 - I Am Become Death. Christi Smith Hayden: Gargoyles 1 - Perchance To Dream, Equality, Turncoat, Consequences * Dark Ages 1 - A Guard's Story, Prince Of Thieves part 3, Dreadnought, Alliances part 1 * Pendragon 1- Into The Woods, The Watching Eye * Timedancer 1 - Out Of Joint part 1 and 2 , The Promise, Daylight, Fleeting Encounters, Dishonor *** Gargoyles/Pendragon 2 - Disobedience; My Fair Lady; When the Bough Breaks, pt 1 & 2; Night of the Wierd; Something Old, Something New; with contributions to Hazards, Blood Moon and The Darkest Hour, pt 1 & 2 *** Pendragon 3 - Oh Holiday, pts. 1 & 2. John Gray: Timedancer 2 - Sacred Paths; Eye for an Eye * Dark Ages 2 - Only Human *** Timedancer 3 - Nor Iron Bars a Cage. Jonathan "Entity" Cotleur: Timedancer 1 - Games Without Frontiers *** Gargoyles/Pendragon 2 - Odd Couples; Re-emergence, pt 1, 2 & 3 * Dark Ages 2 - Nowhere to Run; Nowhere to Hide; Bandit's Gambit; The Wedding, pt. 1: Not Wisely, But Well; The Wedding, pt.2: Destined Hearts *** Timedancer 3 – Giri, A Thought of the Heart; Once I Built a Tower; contributions to Fire and Ice. Joshua "Nicodemus" Whalen: Pendragon 1 - The Stone Of Destiny * Dark Ages 1 - Ever Faithful, Prince Of Thieves part 3 * Timedancer 1 - For Old Times' Sake *** Timedancer 3 - A Merrier Hour. Rahsaan Footman: Gargoyles 1- Fealty, Things Fall Apart 1 and 2 * Pendragon 2- The Ill-Made Knight part 1, 2, and 3, Visions, Dragon's Wrath * Timedancer- Flight Into The Forest *** Gargoyles/Pendragon 2 - The Yorkshire Adventure; Triangles * Timedancer 2 - The Sun and the Serpent, pt 1-4; Crossroads, pt 1 & 2 * Dark Ages 2 - To Every Season; Equinox *** Pendragon 3 - Iris, Lily, and Rose, pts. 1 & 2. * Timedancer 3 - Deals and Exchanges; A Thought of the Heart. Stephen R. Sobotka Jr: Gargoyles/Pendragon 2 - Disobedience; Reunions; Waiting Game; The Darkest Hour, parts 1 & 2; Aftermath, parts 1 & 2; Something Old, Something New * Dark Ages 2 - Kindred Spirits; Serendipity, parts 1 and 2 *** Timedancer 3 - contributions to Return to Paraside, pts. 1 & 2. Todd Jensen: Pendragon 1 - The Return, The Last Enchantment parts 1 and 2, The Goddess of Winter parts 1, 2, and 3, The Watching Eye, The Tain, Quest's End * Gargoyles 1 - The Sorcerer's Apprentice, Mutual Trust, Things Fall Apart 1 and 2 * Dark Ages 1 - Perspectives * Timedancer 1 - Conscience Of The King *** Gargoyles/Pendragon 2 - The Rising, pt 1 & 2; Beginning Again; Nocturne; The Hawk and the Crow; The Longest Day; Ploys; In the Blood; The Drowned City; The Darkest Hour, pt 1 & 2; with contributions to Homecoming * Timedancer 2 - The Downfall * Dark Ages 2 - Dragon's Stone; The Adopted *** Pendragon 3 - Expatriate; The Curse of Rivencroft; The Sleepers; Giants in the Earth; Iris, Lily, and Rose, pts. 1 & 2; Dark Passions; Ripper; The Once and Future King, pts. 1 & 2. * Timedancer 3 - A Merrier Hour; A Tale of Two Gates; Twilight Falls. * Gargoyles 3 - Thicker Than Blood; History's Forgotten; Unions *** Timedancer 4 – Solstice, Before the Storm, Two Roads Diverged pt 1 & 2, In Love’s Name * Pendragon 4 - ...18 out of the 24 episodes this season. Dreamie: Timedancer 4 – Two Roads Diverged pt 2, In Love’s Name. Stephanie "Raptor Woman" Lostimolo --designer of the original TGS website, used 1997 to 2009. Chris Rogers of Wyvernweb.com and Gargoyles-fans.org, for use of web space to host TGS. Gorebash, for the creation and use of The Gargoyles Saga Comment Room. 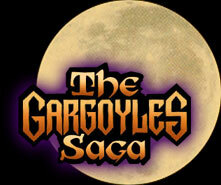 All the Website Masters who linked to The Gargoyles Saga on their web sites. The Fans, for their patience, persistence, anticipation, and continued support for this project. YahooGroups.com use of their mail server for the TGS idea staff account, and to EGroups.com before that (TGS seasons 2 and 3) and Starfleet Region 3 before that (TGS seasons 1 and 2), and to Matthew Orwig for starting the first mailing account. TGS 1 gave thanks to Wingless and Griff for their donations of pictures for the original website.